Last month we welcomed Cheryl Zubrack out to the resort to participate in our little Artist in Residence program. It is always a treat welcoming folks who are connected to the Falcon Trails community, Cheryl has become a good friend of ours, we have got to know her through her daughter Michelle who has worked for years as a ski instructor and massage therapist here at Falcon Trails. During her stay Cheryl worked tirelessly on her beautiful acrylic paintings of Canadian shield rock detail. Read more about Cheryl’s time at the resort below. What a privilege to spend five peaceful days making art at Falcon Trails Resort. It is always challenging to find time to focus on one’s creative pursuits. Having this gift of uninterrupted time was amazing. Falcon Trails in October is the ideal place to “wake up at the lake”! The autumn light, the glorious colours, the snow, the leaf covered trails, and the one incredible +23 day that was perfect for paddling made my stay most memorable. The Shield is a source of creative inspiration and energy for me. I am interested in what rocks – at once extraordinary and completely ordinary - communicate about the earth, about time, place, change. I am curious about the stories, some as old as three billion years, that are held within these ancient, precambrian forms. Stories that captivate the imagination, stir memories, evoke a journey, invite contemplation. Thank you so very much to Falcon Trails and the Christie Family for this incredible opportunity. Thank you for sharing your paradise with me (and Michelle)! Thank you for supporting the visual arts. It is truly an honour to have one of my paintings in your collection. 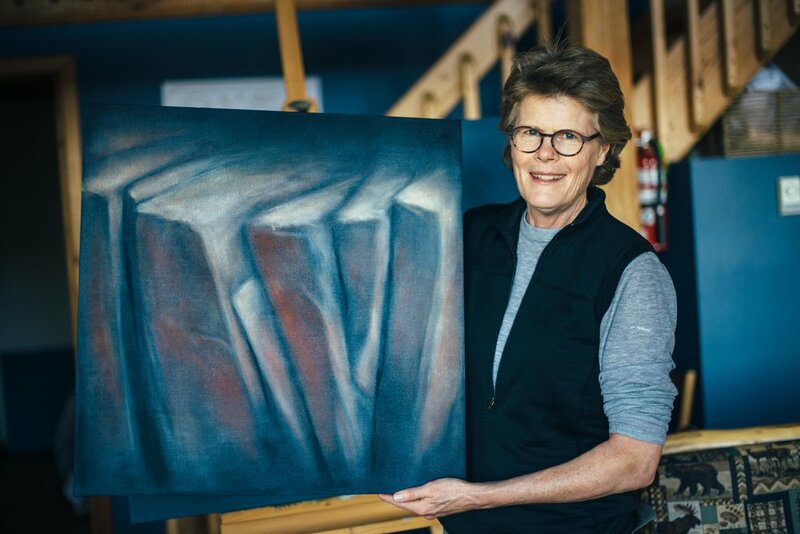 Cheryl contributed this beautiful painting, "Earth Stories" to the Falcon Trails gallery which showcases the artists who have participated in the residency.